We often get asked what makes our duvets different to down and feather duvets, so here are a few points that should we hope clear things up. Good silk duvets are made using only long fibre mulberry silk. By using only long fibre silk, a silk filled duvet has some properties that others do not. Mulberry silk duvets are designed to let some of your body heat pass through the duvet while you sleep. By doing this they keep you warm but stop you from overheating throughout the night. Silk duvets keep you comfortable over a wider range of temperatures. Because they allow some of your body heat to escape they keep you contented rather than too hot or too cold. Long fibre mulberry silk is naturally healthier than down. Because there is less sweat produced by sleeping under silk duvets, there is less bacteria build-up in a silk duvet. Less bacteria build-up = a healthier bed. Silk filled duvets drape over you, hugging the contours of your body. By doing this they create less cold spots between you and the duvet covering you. Well made mulberry silk filled duvets, like our own, will not bunch together inside the duvet casing. This is because the silk filling has been layered in long filaments of silk. Down and feather duvets are designed to stop your body heat from escaping through the duvet. This initially keeps you warm, but throughout the night your body heat continues to be reflected back at you and you overheat. Down duvets are unable to help keep you at a constant temperature and you will need a wider range of weights throughout the year. Down is a very good insulator, but can often be too good. Moisture trapped in down from body sweat is often unable to escape from the duvet. In advanced cases can result in unhealthy mould spots. Down duvets are soft, but still more rigid than silk duvets. Down is unable to drape over you the way in the same way silk duvets do - this is because there is physically more bulk in a down duvet. 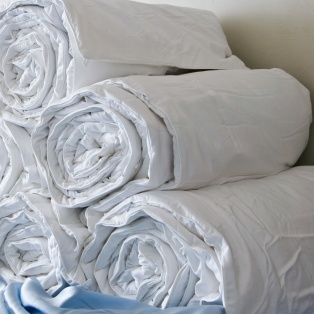 Most down duvets are stuffed and then sewn into individual pockets to keep the down in place. However, over time the down in these pockets bunches together which can make the duvet lumpy and uncomfortable to sleep under and create cold spots.